This book was first recommended to me by my spiritual teacher before her passing in 2002. In reading ‘Conversations with God, book 1′ I felt incredible support from the inner levels throughout. ‘Conversations’ was straight forward enough, and the concepts within the book spoke true to me. As I read I felt great relief, as many old Catholic beliefs released. It helped me to see that some of the “truths” that I had been led to take on in childhood, limited my development, and were in fact ‘invented’ and of no help to me now. ‘Conversations with God, book 1’ somehow hit the exact right note, drawing those untruths from me. Reading this book gave me a renewed sense of freedom and inner peace, and excitement at the breadth of the concepts. ‘Conversations’ gave me a powerful new beginning in opening to the joys of spiritual life, and in letting go of beliefs that were hindering my highest well-being. In this article I look at some of the ideas in the first chapter, that inspired me, and recommend Walsh’s work to you. For me, this was a revelation. In my youth I had been trained to rely on my thoughts rather than my feelings. I had been taught to believe what others told me to be true, and to absurdly revere reason and logic as truth. To deny my innermost feelings, relegating them to a lower relevance than thinking. ‘God,’ the Universe and everything – is more about what the individual experiences and not so much about arguing theology, accepting dogma or attempted rationalising about what may or may not be true. ‘Conversations’ invites the reader to seek their own ‘direct experience’ and find out what, beyond all of the now unconsciously held beliefs, is actually true. And, as with all true teachings of the spiritual path, one is encouraged to discern and discriminate. To only consider what ‘feels’ that it might be true, and explore this to find out if it is so for you or not. Away from the teachings of my youth that stimulated guilt, fear, awe and sin, ‘Conversations’ gave a beautiful picture of resting in ‘knowing’ when something is of God. Beyond all of my unanswered questions and childhood worry and doubts, ‘Conversations’ offered: “The Highest Thought is always that thought which contains joy. The Clearest Words are those which contain truth. ‘God’ requires from us to be humble, receptive, willing to listen and hear, willing to surrender to what is actually True, rather than what we impose upon Truth. In my own experience, this may well come when one “seeks first, the kingdom” (Bible); when one directs one’s attention within. So life is rather more simple if I am not waiting around to find out what I “should” be doing, or feeling guilt that I might have somehow got it “wrong.” Life and God offers me the opportunity to create. To make what I will of this life and to act however I so choose. “The deepest secret is that life is not a process of discovery but a process of creation.” (20) N. D. Walsch recommends that we seek NOT to find out who you are, but “seek to determine who you want to be.” (20) To allow yourself to be a full part in the creation process. In my own spiritual development, I spent decades under the influence of wondering what God wanted of me. Was there some mission that I was on?How would I know if the actions I took were correct for my quest? Was I on the right track? Could I be as idealistic as the expectations I had internalised from childhood? Here in ‘Conversations’, Walsch suggested that “I” was the one to decide that for myself. I realised that I had given myself over to other people’s ideas and internalised them until they had become unconscious, though virtually running my life. To not sit around waiting for a ‘call to battle’ or, as a mentor continually reminded me “thinking that my life’s purpose would be presented before me in neon lights.” It was up to me to choose, and gradually, as I do choose by what feels right, I continue the activities that make me feel alive and contributing. ‘Conversations’ awakened me to the influence that I have over my own life, and that I am the creator of my own reality. It focused me to remember that every thought one ever holds, is creative. Chapter one concludes with Walsch reminding that God is Love and that God responds EVERY time we ask. It is but for us to be receptive to HOW ‘God’ answers our call. 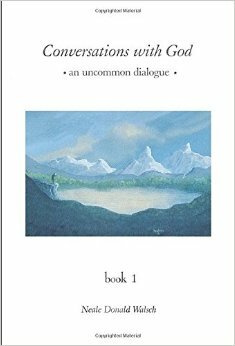 All page numbers quoted here are from ‘Conversations with God, book 1’ by Neale Donald Walsch. Hodder 2000. I hope that this article encourages you to look at more of the work by Neale Donald Walsh.